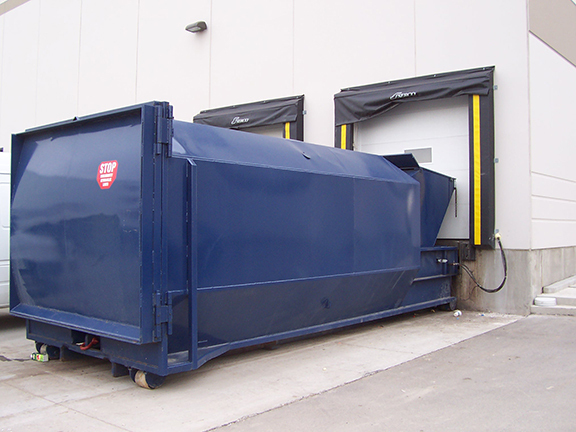 Self-Contained Compactor | AC Waste Services Inc.
Pharmaceuticals, hotels, hospitals, restaurants, shopping centres, and food processors (over 30 cubic yards per week). Clear top feed opening is wide-mouth 43’’ x 60’’. Compactor limits owner liability by discouraging rummaging through waste. Control panel is key-activated, fully enclosed and weather proof. Access to packing ram is when compactor is activated is stopped due to safety interlock devices. Design prevents bird and vermin infestations. Full perimeter door seal prevents spillage of waste. Truck carbon emissions drastically decreased due to minimal haulage requirement. Suitable for both wet and dry applications. Compaction ram dwells against the load with 16’’ ram penetration — 100% more than most competitive models. Waste can be decreased to a mere fraction of its starting amount. 15%-50% more force than it’s competitors — over 31 tons of compaction force. Can be mounted on both concrete and asphalt. Front, rear or side loading. Functional with an array of electrical voltages.